Little Criminals offers all the minor charms of Randy Newman’s music and none of the major ones: craft without vision, which means the craft is uninspired. The songs aren’t even funny; they lack bite. Neither Newman’s performances nor his words carry the conviction needed to put across his situational ironies, gnomic narratives, and skewed moral tales, in fact, this time around, the ironies, morals and narratives seem too slight to elicit conviction. Newman can’t put all of himself into a song as vague as “I’ll be home” or as pallid as “In Germany Before The War,” because the songs contain so little of him. One can go back over Newman’s work and find any number of tunes that cry out to be heard, whether or not very many people actually did hear them; there isn’t a song on Little Criminals that sounds as if it needed to be sung. Newman has always been ambivalent about his his ambitions, aesthetic as well as commercial, but this is the first time his ambivalence has gotten the better of him. What Little Criminals showcases are not songs, but arrangements, plus the contributions of various members of the Eagles. The arrangements are good—particularly with “Jolly Coppers” and “Baltimore”, not to mention the dreamy bandbox sound on “Siegmund Freud’s Impersonation Of Albert Einstein In America”—but they’re good in limbo; the music fails to bring out Newman’s lyrics and his singing, because both are so limited. “Baltimore” is clearly meant as a statement about The Death Of An American City, but there isn’t a detail in it that has anything to do with Baltimore. Where is Newman’s eye for the specific, the eye that picked out the little fat man next to Calvin Coolidge in “Louisiana 1927”? Some of the new songs never rise above the level of the tame joke, but “Siegmund Freud’s Impersonation Of Albert Einstein In America” aims half-heartedly at serious satire. The song was meant for the soundtrack of Robert Altman’s now-shelved movie-version of Ragtime; the worst that can be said of it is that it fully matches the cheap sarcasm of E.L. Doctorow’s book, and the best that can be said of it is that there is a touching beauty to the way Randy sings the opening line: “The world of science is my game/And Albert Einstein is my name.” The problem is that Newman is no longer taking on the personae of his characters, and so, beyond that first turn of phrase, “Freud” and “Einstein” evaporate. Newman simply has nothing to say—except that America is not all it’s cracked up to be, a notion unlikely to stagger even the unwary. 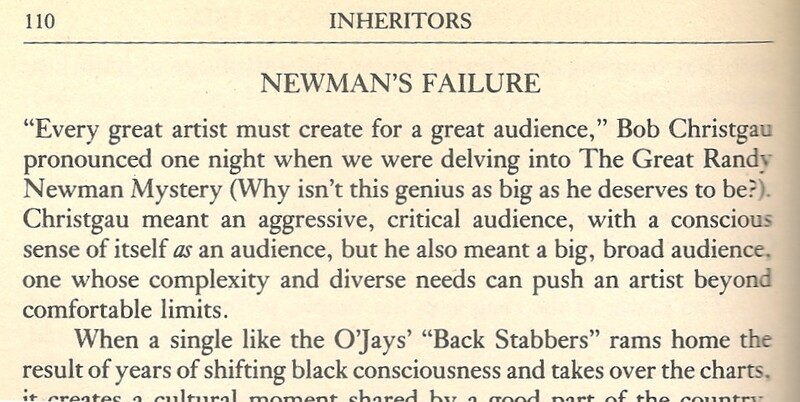 Though Newman has occasionally pandered to his cult of fans—congratulating them for being hipper than the rest of the rock & roll crowd—he has most often dealt with his lack of a broad range of listeners by offering the big, shapeless pop audience work that is better than it demands and tougher than it can handle. He has challenged that audience to respond to his work, and thus challenged himself, as a born minority artist, to reach that audience without conceding anything to that audience’s weaknesses. With Little Criminals, one can still say that he is making no concessions, but that is because he seems to have none to make. Elvis Costello’s debut album brought home to me just how timid Little Criminals really is. Costello’s best songs are anything but timid, but they’re as intelligent as some of Newman’s finest, as endearingly elusive in their meanings, and funny in the same bitter, self-deprecating manner. They’re also, like Newman’s signature songs, very weird. Costello, a twenty-two-year-old ex-computer operator who grew up in Liverpool and now looks like an underfed, misanthropic Buddy Holly, is proof that not only are things quite strange in England today, they are capable of getting a lot stranger. It should be said out front that there is a strictly musical difference, among many others, between Newman and Costello. Newman draws on ragtime, blues, Kurt Weill and movie music to orchestrate his lazy drawl; Costello, who in his quieter moments sounds something like Nick Lowe, who produced My Aim is True, aims for tricky, infectious pop stylings, or he rocks out. In his less quieter moments he often sings as if there’s a gun at his back, and he talks like a true pop obsessive. His songs, he told Nick Kent of New Musical Express, are motivated solely by “revenge and guilt”; he hates the record business so much he has begun to keep a blacklist against the day he seizes power. He wants to die before he gets old: “I’d rather kill myself… I’m not going to be around to witness my artistic decline”. There is genius in the wording of that last sentence, and it has found its way into Costello’s songs—which tend to the neurotic, though never at the expense of finding the right place for the right lick. His most striking number might be “Less Than Zero”, which Costello wrote after watching the BBC-TV rehabilitation of Oswald Mosley, in the Thirties the leader of Britain’s pro-Hitler Union of Fascists and today a hero of the racist, neo-Fascist National Front. The message is plain: if there’s a place in British society for people like Mosley, then there is no place for Costello—none that he wants anyway. This entry was posted in Album Reviews and tagged Elvis Costello, Greil Marcus, Randy Newman, Rolling Stone. Bookmark the permalink.